Cindy and I needed a CBD lunch before hitting Alia Shawkat's MIFF event. We'd usually revisit Shandong Mama, but we decided to take a break from Chinese food and hit up Union Kiosk. 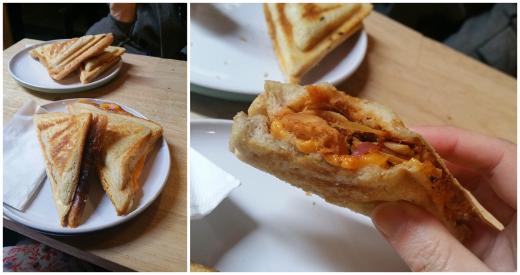 It's a tiny hole-in-the-wall place on a little laneway pumping out a wide array of vegan toasties and coffee. 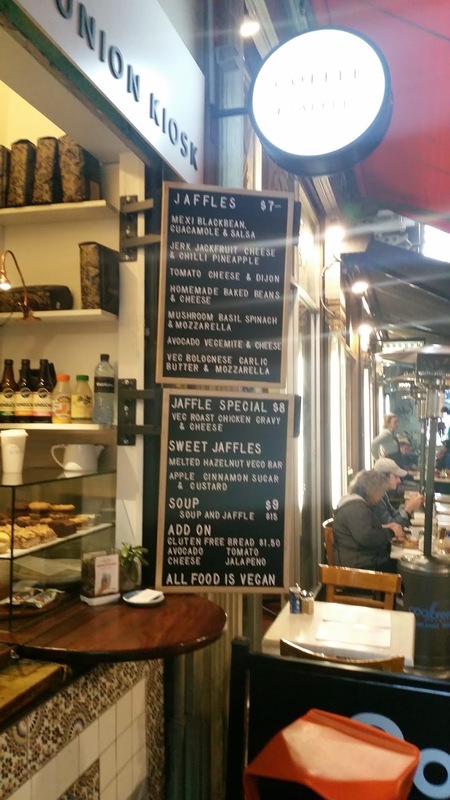 It's kind of incredible to think that Melbourne can support a wholly vegan jaffle place - we've come a long way since this blog began in 2006. Anyway, the menu offers up eight savoury and two sweet jaffles, ranging from delights like veg bolognaise, garlic butter and mozzarella through to a melted hazelnut Vego bar jammed between two bits of bread. It's charmingly inventive for a place with such a narrow focus. I ordered the special - roast chicken, gravy and cheese ($8). The 'chicken' was jackfruit based (kind of reminiscent of our go-to jackfruit chicken recipe) and deliciously smothered in impressively melty cheese and a decent gravy. Cindy was even bolder, ordering the jerk jackfruit with cheese and chilli pineapple ($7 - pictured, right below). She loved it, insisting it was better than mine, with nice spices on the jackfruit jerk and a decent amount of pineapple dotted throughout (a terrible mistake, if you ask me). 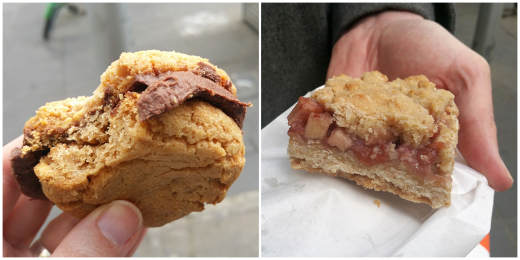 We grabbed some takeaway sweets for our walk to the theatre - a berry crumble slice for me and a chocolate peanut butter sandwich cookie for Cindy. They both did the job very nicely. 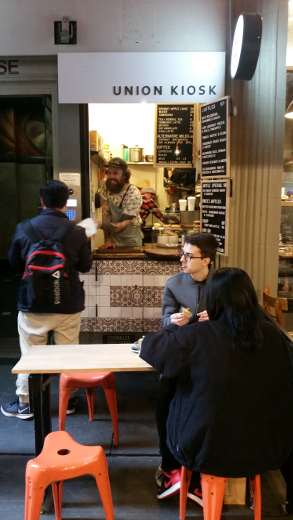 Union Kiosk is a fantastic CBD option - a wholly vegan place that has really nailed down a niche. We'll be back! There are a couple of very positive reviews of Union Kiosk on veggie blogs The Good Hearted and Messy Veggies. Accessibility: Union Kiosk is tucked in a crowded, uneven laneway. There are only a couple of tiny tables with low stools. You order and pay at a low counter. We didn't visit the toilets. Last time I was in Melbourne I was looking for a new CBD lunch place to try and I walked right past this place, but I didn't know about it and didn't notice it and I missed out on delicious jaffle goodness and instead got a vegan poke bowl thing from another place, which was fine but... delicious jaffle goodness! Ah, that's a shame! Hope you'll be back with a second chance soon. Johanna, they are open weekends - otherwise we'd also have no hope of getting there!